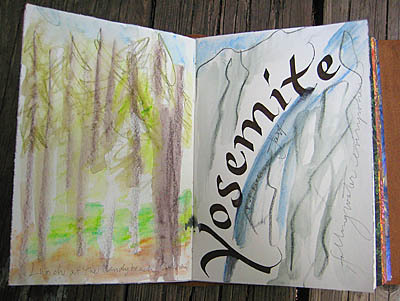 A couple of glimpses from my art journal: above, from a wonderful trip to Yosemite National Park last week, where we were lucky to enjoy some beautiful warm weather, a little hiking, waterfalls on every rock face, and a picnic lunch by the green, green Merced River where I had a few minutes to get out the Inktense pencils and the portable calligraphy pen (Parallel pen with a 6.0 nib) and capture a few of the sights and colors of this enchanted place. Yosemite is a living cathedral; we had our lunch that day in sight of the Cathedral Spires. It is a place of Big Magic. 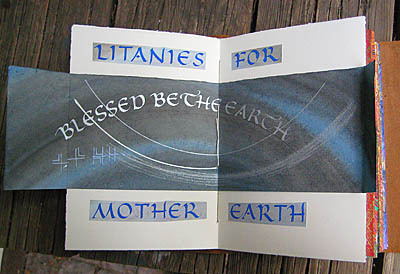 Below, I sewed and pasted in some of lettering and markings trials for an almost finished book, tests for centering words (lettered words cut out, measured and the center marked with a pencil line), and practicing arcs with the ruling pen attached to a compass and dipped in iridescent ink, then spread out with a rough brush. I have been so busy in the studio I’ve hardly had time to do anything else, so the pilgrimage to Yosemite last week has me recharged and ready to go back to work. Just found you via a comment at Hecate’s blog. I love your work. The arcs with iridescent ink add a very special dimension. Thank you, Tess! I just enjoyed your blogs too, especially the Sacred Graffiti one. Great name! and outstanding selection of poetry. I had forgotten that poem by Gary Snyder, but remember loving it in college 35 years ago. Thanks for introducing yourself! I just want to say what you do is so very inspiring to me. Over the past several months I have been doing a lot of soul searching which I guess is what you do when you hit about middle age. I have been doing lots of praying too. I have had this inner voice for years telling me to teach art workshops, I have always been artistic. I kept asking how, where, when? Then I would stuff away that inner voice because I would get preoccupied with other things or sometimes it was just fear. I have been writing in a journal/diary since I was 7 and through out my whole life after that. I am at the point where I can no longer write very much or for too long because I have very bad tendinitis in my arm. So I started doing picture journals with paints, oil pastels, pictures and cut and paste collages. (My favorite being vintage ephemera or vintage anything really!) More pictures and less words. Then I have started experimenting with making very basic almost child like scrapbooks (perfect for teaching children how to do). I have also been having fun decorating the covers of plain journals. So the inner voice has been coming around again and this time it is saying aha! You have found something to teach! So next I will be researching how to go about doing this. Then I ran into your blog and website purely by accident. I do want to say your art and what you do here speaks volumes to me (in stereo). I just wanted to share a little bit about me and to thank you for being an inspiration because what you do is really what I dream of doing some day.